Your dentist may recommend you get a dental bridge when you are missing one or multiple teeth. A removable bridge is a piece of denture which can be taken out, where as a fixed bridge can be cemented onto your neighboring teeth. 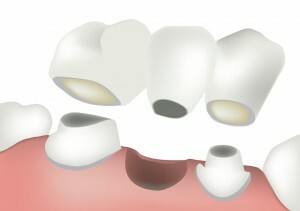 A dental bridge is a set of three or more teeth together, which will replace a missing tooth in the middle. The neighboring teeth will each receive a crown on top of them while a fake tooth resides in between them. It is constructed as one piece in a dental lab, and is usually cheaper, safer, and easier than more advanced procedures such as dental implants. If a missing tooth goes untreated, it can cause the remaining teeth to shift into that empty space, which is bad not only cosmetically, but it can also affect your bite. Once the teeth have started to move, you may have to get a bone grafting procedure to correct them back to their normal places. Please note that patients who have missing teeth are at risk for developing TMJ (temporomandibular joint disorder) and gum disease. As we mentioned earlier, an alternative to bridges are dental implants, which are prosthetic teeth which can bond to your jaw, just like a normal tooth after healing. This procedure is a bit more intensive, so people with diabetes, heart conditions, or bone loss may not qualify for implants, but they can instead get a bridge! If you are interested in a dental bridge or dental implants, please contact our South Tempe office for a consultation!